"I have had a lot of smoked foods in my life, but NONE of it compares to Smoking J's BBQ. Their smoked ribs and other specialties are truly out of this world!" It was our gastronomic pleasure to have you! Had numerous compliments on your feast. With thanks from the board. Thanks for taking such good care of us and our guests. Everything was delicious and the entire night was perfect. Thanks for making Eric'a birthday fun and easy. Dear Jerome and Staff, Thanks for the great food and wonderful Service at Jessica and Chris' wedding. It was truly a terrific party! Wanted to thank you for the AWESOME and amazing food experience. Our guests and us were blown away. It was delicious and perfect. The right stuff,the right time and perfect amount. The leftovers were gone by tonight. YUMMMMMY! An extra thank you to your staff; Maz, Jimmy and Kyle. They were such a great help. "I had the pleasure of attending a party catered by Smoking J's BBQ last summer and let me tell you...the food was delicious. The professionalism that Joe and Jerry displayed was top quality. The guests at the party all enjoyed the food. It was all delicious! The side dishes complimented the meats wonderfully. I would recommend Smoking J's to anyone planning a party!" last 30 years. We cannot really take all the credit, we were just the lucky one's to find you and Joe and the extra staff you were able to assemble at last days notice. Funny, we were worried no one would show and ended up with 99 members, over 40 in the last week were added to your task. The food was wonderful, everyone complimented the quality and the ability to fill their tummies. The girls were out of this world, they came and took over preparing our provided appetizers, serving them and cleaning up the entire kitchen. What a surprise. Your operation is cool (well it was HOT), the equipment is awesome and sure makes for entertainment and a perfect meal." We all thank you for taking great care of us and making our special opening season party a huge success. Thanx Jerome, Regards to Joe." I just wanted to take a second to say thank you again for making Griffins graduation party a HUGE success. 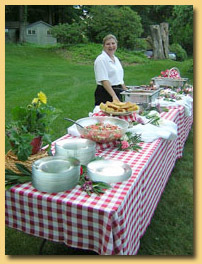 We all know how parties go, everything could be terrific but if the foods not good, that's all the guests will talk about. Well not in this case. Yesterday's food was AMAZING and that's all our friends talked about! Not only was the food great but all of you could not have been nicer. It's always a pleasure doing business with "nice" people. As Griff put it, you guys are the "real deal" and no one could have done it better. I will certainly put your name out there and hopefully our paths will meet again. Once again, thank you thank you! !